landmarks for the 32-year-old from Hampshire. His fourth album, 2011’s England Keep My Bones, sold more than 100,000 copies and entered the UK Charts at number 12. Its follow-up, last year’s Tape Deck Heart, has ushered in a new level of success. So far, it has sold 200,000 copies. It entered the UK Charts at Number 2 and the iTunes Charts at Number 1. Five singles have been released from the record, each underlining Turner’s arrival as a crossover DIY star: the break-up vignette Recovery, the stirring, mandolin-flecked singalong of The Way I Tend To Be, the rousing, anthemic Oh Brother, Losing Days and the recent Polaroid Picture EP all showcase Turner’s increasingly daring dynamism as a solo artist. Not one to rest on his laurels, Turner's live achievements may be more impressive than his recorded works: opening the 2012 Olympic Games, high billing on the main stage at the Reading and Leeds festivals, a sold-out UK arena tour, where Turner later admitted that, “playing an arena tour of the UK was a strange, bold, terrifying and ultimately beautiful thing…I never expected to find myself playing in rooms of that size, and I was concerned about making the shows as good as they could be, about making sure that the connection with the audience wasn't lost. In the event it was a massive rush and a resounding success." 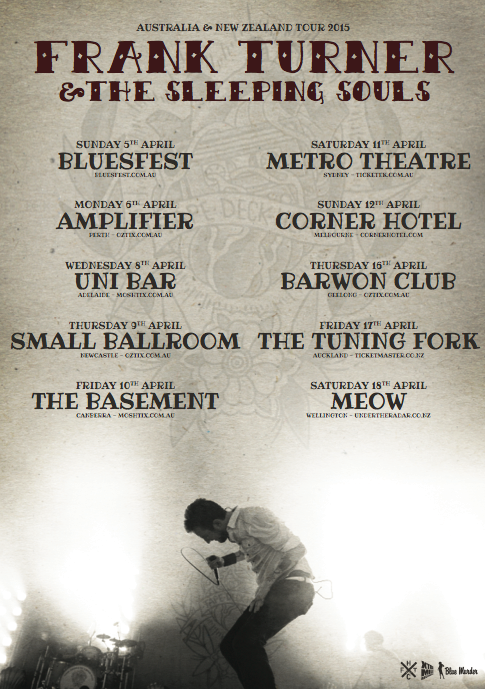 Don’t miss your chance to sing and dance along with Frank Turner & the Sleeping Souls as they tour nationally this April. Tickets on sale 9am Wednesday 26th November.